It's no secret that bad habits (including negative self-talk) are hard to break. 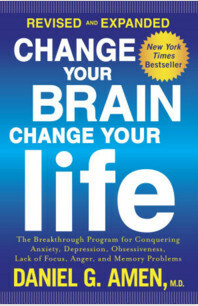 The revised and expanded edition of Change Your Brain Change Your Life explores how to make lasting changes that will help you overcome behaviors and compulsions that are holding you back from living a productive, fulfilling life. The author, Daniel G. Amen, is the head of a group of clinics that use SPECT (single photon emission computed tomography) studies to scan the brains of patients to determine if there are biological issues causing such problems as anxiety, weight control, or ADHD. Most patients he sees have never had studies taken of their brains, but have rather immediately been prescribed numerous medications in an effort to attack their symptoms, without ever trying to get at the root of the problem. Dr. Amen's philosophy is to see if non-pharmaceutical therapies might not work better and be long-term solutions for many of his patients. He does this by seeing what parts of the brain suffer from decreased blood flow or activity, and developing an individualized plan for treatment of that specific condition. Even if you don't have access to a center where a SPECT scan can be done of your brain, Dr. Amen uses what he has learned from studying brain scans over the years to give advice to people suffering from various behavioral and emotional problems. Various conditions are explored (including anxiety, impulsiveness, worry, etc.) including what part of the brain controls such behavior. Then, strategies for dealing with each condition are outlined in 4 areas: biological, psychological, social and spiritual. Plenty of examples involving real people and situations are used to demonstrate how each condition might manifest itself followed by coping strategies in each of the 4 areas. Even if you suffer from a condition, such as ADHD, there are differing types. Chapter 16 goes into detail about the various types of ADHD, anxiety and depression, addition and overeating. If you suffer from any of these conditions, you will probably see yourself in one of the descriptions. One thing I found surprising was how resistant the medical community was toward using brain scans to diagnose biological causes of medical problems. As Dr. Amen says, psychiatrists are the only doctors who don't get a look at the organ that is troubling their patients. His advice is useful for everyone and likely will help to reduce the number of unnecessary medications that are taken by people with problems caused by underlying biological conditions.